Born in Slovakia, her family immigrated to Melbourne, Australia when she was young. Lucia’s creative side was always dominant and she completed a Bachelor of Fine Art at Monash University in 2001, where she practiced with mixed media. An avid nature lover and collector, she has always admired and collected Earth’s natural treasures, and has applied them into her artwork, blending found objects, antiquities, textiles, and ethically sourced animal remains into the rekindled artwork you see here. She is a mother of 2 boys, helps her husband run his tattoo business, and as an animal advocate and environmentalist she has been a long time financial supporter of worldwide animal charities such as World Animal Protection (formally WSPA) and local Australian charities such as Backyard Buddies and Mt Rothwell Conservation & Research Center. Her artistic influences include the Czech stop-motion animator Jan Švankmajer, bone artist Jessica Joslin and taxidermy artist Sarina Brewer. The human-esque taxidermied animals are inspired by children’s fairy tales and universal creation myths, cultural tales, historical eras and much loved characters. They are one-of-a-kind hand made pieces whose furs are sourced ethically and put together with conscious and curious involvement. Many of the clothes and accessories are authentic antique or vintage pieces sourced world wide from the era the character is representing. The plaques are solid walnut or birch wood. The domes natural contents are all foraged from nature and found as is (ie: already dead). Each dome is one-of-a-kind, and like the taxidermy, they feature authentic antique/vintage collectibles and miniatures. Sizes vary and so do bases. All of the artworks are made using ethically sourced animal and insect remains. Foxes in Australia are causing widespread damage and endangering the native Australian ecosystem bringing native animals to the brink of extinction. They are ethically culled on government orders for environmental reasons and instead of their bodies perishing and going to waste, they are given a second life as art. As an avid animal lover and environmentalist the artist does everything possible to maintain high morals and ethics when using animal parts and donates to wildlife charities which help to rebuild our natural Australian ecosystem and encourage our native animals to thrive. The insect domes are all made with foraged finds from nature and found as is, no creatures are harmed for the art itself. All of the artworks are made using ethically sourced animal and insect remains. The ethics of using animals for taxidermy can often be considered a conundrum, though in Australia foxes are infamous. The Australian Settlers of the 1700’s made a really big mistake with terrible ramifications – they brought over foxes from Europe as they loved the sport of hunting and hadn’t heard about kangaroos. For the past two hundred years the foxes have been left to their own devices and have reproduced at an alarming rate. They are causing widespread disaster for our native animals as there are no large carnivores to hunt the introduced foxes and keep their numbers at a balanced level. Many of our native marsupials are now endangered and some have become extinct. Foxes are great hunters and native mammals are their dinner. Rabbits and hares have the same diet that small natives have and they take over their natural habitats, cause land erosion where nothing can live or grow, and reproduce much faster than our small natives do. Foxes, hares, rabbits and wild cats are seen as major pests in Australia and if allowed to populate freely without human intervention, it would not be long until we would only see these introduced species in the wild. I bet most Australians have never seen our natives such as the bilby, numbat or bandicoot in the wild. Without keeping the foxes, rabbits and hares in check, our natives will sadly be lost forever. So we are battling to undo our forefathers mistakes, though as you can see below, it’s not a battle we are winning. Crazy amount of foxes near Ballarat, Victoria. I personally have a great love for and kindred bond with foxes and hares as these come from my homeland of Slovakia. But sadly, I understand that these beautiful creatures don’t belong in Australia and do great harm. I am an environmental advocate and conscious artist and I feel passionate about making something positive out of this sad situation, while simultaneously raising awareness of the plight of native animals. Native animal conservation is intrinsically linked to the control of the population of wild foxes and rabbits in Australia. 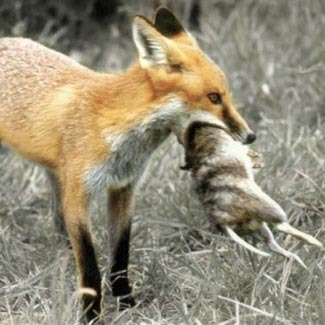 The Australian Government has measures to ensure the ongoing survival of our endangered native species, and this includes careful culling to control invasive species such as foxes and hares. Usually the culled animal remains would be left to rot, like in the image above, but instead, I attain the skins and create art, rather than see them go to waste. This is ethical and ecological taxidermy. Taxidermy art which aims to bring attention to these issues in hopes that more people look deeper and take action to protect our environment. The foxes and hares in my work are dressed in costumes from all corners of the globe. They represent how these animals have migrated to many continents of the world, have urbanised themselves and adapted to many different situations and environments – sometimes destructively so. My work explores parallels with human settlement throughout the ages and entertains the idea that soon enough, there may be humans (and hares!) on the moon. If you feel strongly about saving native animal lives, please keep in mind that domestic cats are huge problem too. If you have an outdoor cat please put a big colourful cat scrunchie on it’s neck, as well as a bell. This will save the lives of native birds who have keen colour vision, while mice whose colour vision isn’t as good will still be caught. Your cat will look very dapper while being a bit more eco-friendly. Marsupials who are usually out at night when vision is difficult can be saved if you bring your cat in from dusk to dawn. Everyone’s efforts in their own backyards, even in urban areas, have an impact on the whole ecosystem and can help conserve Australia’s unique native animals for future generations. A percentage of proceeds from the sale of my artworks is donated to Mt Rothwell Conservation and Research Center and World Society for the Protection of Animals (WPA). More information – foxes in Australia, rabbits in Australia, how to stop your cat from killing birds. cat scrunchie purchase, speaking for the bandicoot, bandicoot factsheet, bandicoots at Cranbourne Gardens, red fox abatement plan, Mt Rothwell Conservation & Research Center, Bush Heritage org.